Hoping But Not Needing – Hi Blog! I'm Dad. My son is non-verbal and has Autism. I can say that out loud today without any sense of defeat or uncertainty. I know how it has become a natural part of our family, which is more than I knew five years ago. It’s nothing like how I initially pictured it would play out in many ways and the worrisome premonitions that haunted me in the early days have never come to pass. Sure, things can get rough, but he’s my little guy and we work through them like any parent and child. I’m proud of who he is and, while he still pushes forward to newer victories each day, I don’t stress about the times when he doesn’t. Life moves on and we become who we are. This is who he is right now. He might be someone different tomorrow. He might not. I love him no matter what. We’re all good. I don’t like to think much about it, but there was once a time when everything wasn’t as it is now. It’s back when I had no first-hand knowledge of my baby son as a person, much less a person with Autism. All I really had to go on when it came to our new diagnosis was guesswork and horror stories. “Autism” is placed on a foreboding pedestal for every expectant parent in the months leading up to the baby’s arrival. There’s a never-ending laundry list of things you are pushed to do in order to avoid having a child on the spectrum. There are tests and diets and medical conspiracies that are repeated to us ad nauseum before we ever welcome this kid into the world. It feels like so much of the baby pre-party is spent talking about ways to avoid anything that society might consider outside of the norm. So you walk the tightrope and wish for the best. And then, one day, there you are. Autism. Suddenly the air gets taken out of your sails. This whole time, you were simply told not to catch Autism like some phantom cold in the air. No one ever prepared you for what it actually is or what to do when you did “catch” it. It was here and I had no idea what comes next. Making it all scarier was that I knew next to nothing about this new chapter in my life. The bulk of my information was what people told me. The only truth I really had was that the diagnosis I had just received for my wonderful son was on a very short list of things that were catastrophic. It takes a little time to find out that it’s not catastrophic. In fact, no matter what special needs or perceived disabilities your child has, things are different when you’re living them out with someone you care about than they are when you’re imagining a blurry future. Based on what you know at the time, all you can picture is a caricature of what Autism is supposed to be and all the ways it’s could negatively impact your life. You don’t know what the reality will soon be. I often say that my bond with Lucas is unlike one I’ve ever had before. Funny enough, the bond we share is hard to put into words. My wife, daughter, and all those I love in my life share different relationships than the unspoken one he and I have. It’s the beauty of that time spent with my boy that sticks in my head whenever I’m watching a video featuring the parent to a kid on the spectrum. They start talking about how their child first spoke at an age older than Lucas and, for a moment, my heart jumps. I get excited and I think about how amazing it could be if he one day just started talking to me. And then, I immediately feel guilty. Seems like a strange reaction and, to those not in my situation, it is. On one hand, it’s natural to want my son to speak. People can easily understand that. We want our children to learn as many things as we can. I feel the same way I would about my daughter becoming a champion swimmer or runner. I want the most for him. To a non-Autism parent, that emotion seems most logical. Of course a parent would get a sense of excitement over the idea their non-speaking child might one day start using language. Guilt, in this moment, seems like a bizarre emotion. For me, though, as the parent to a child with Autism, it’s not bizarre at all. The guilt comes because that feeling of excitement pulls me back to the early days of his life and that desperate wish that he could just say a word. I remember not knowing who my son would grow to become and how we could ever share moments together. All of those warnings before he was born had convinced me that an Autism diagnosis would take so many things away from me that I wasn’t ready to give up. My desperation to have him speak was less about wanting him to be all he can be and more about making things “right”. In my mind at the time, the hope was that speech would be the missing piece to “save” us or something. I now know that I was picturing a much harsher future than the one that was in front of me. 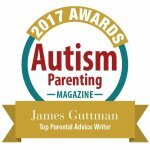 It was all about what I wouldn’t have as a father without knowing the unique moments I would share with my son that another non-autism parent might not. Today, at seven, he still hasn’t said his first word, but that’s not the end of the world. The world is still here and he’s one of the best parts of it. My hope for his future today isn’t framed as it was in the early days. I want him to learn to speak, but I don’t need him to. It’s the same difference between a soccer parent who wants their kid to win but takes them out for ice cream even if they lose and the soccer parent who angrily throws Gatorade bottles from the sidelines. If Lucas doesn’t ever utter a word, we will still have a bond unlike any other. I know that for sure and that’s the difference between now and then. When I feel guilt in those moments, I remind myself that it’s OK to be hopeful. In fact, you’re supposed to be. I love my child as he is and for everything he is, but I still hope that one day he will speak. I also hope one day he will drive, get married, and become President of the United States. He’s my son. Wishing the best for your kid’s future doesn’t have to mean that you’re unhappy with their present. It means you’re a parent. I can fully accept who he is and who he might remain, but I will never stop wishing for him to achieve everything he can and more in his lifetime. That’s what parents do and I’ll never have a real reason to ever feel guilty about that.